Anyway, Pinterest really is awesome. I love its diversity, its completely visual appeal, and its versatility. There's everything from recipes to geekery to home decor to DIY projects to travel destinations to hairstyles on there, and I have to admit, I use it more than Google to find something. If you follow me, you'll see that I definitely use it almost every day. Cute, right? So cute I decided to make my own! This is a gorgeous way to decorate for a wedding, and so easy, too! Bias tape is super cheap, and you can buy doilies in bulk from either Rachael's Scraps (one of my favorite resources) or, if you can find them, at any antique store, Goodwill, or thrift shop. Ready? Let's get started on your DIY doily banner. Begin by chopping your doilies in half. I know, I know - sacrilege! It was tough for me too. Someone handmade the vintage doilies I used, but I comforted myself with the fact they were damaged (you can actually buy imperfect doilies from Rachael - also, you're making something brand-new out of something old, so that makes up for it). Cut the length of bias tape you want to use. I think I measured about 6 feet. 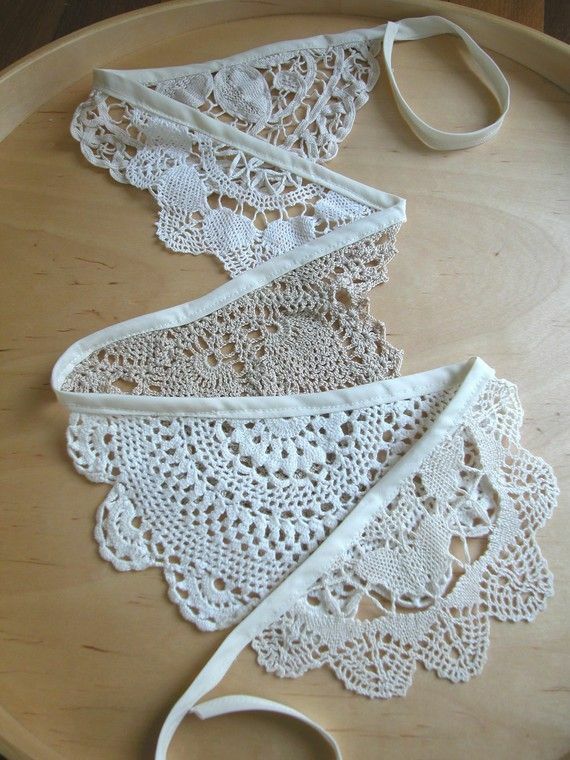 Now space out your half-doilies along the bias tape, sliding them between the folds of the tape and pinning in place. Be gentle, as the doilies may want to fall apart. Make sure they're pushed all the way between the folds and pinned securely! Now run a long seam from one end of the bias tape to the other, sewing the folds together and sewing right over the doilies. Voila! Sew another seam if you're worried about security. You'll see that my doilies are MUCH smaller than the ones in the inspiration photo, but I'm not mad about it. In fact, I think it makes the garland look that much cuter because the doilies are small. Hang this beauty behind the bride & groom table, along a wall, as a table decoration, or wherever you think it would look best!